Russian Yaroslav Mudry Neustrashimiy-class frigate. U.S. Navy command claims that the Russian Yaroslav Mudry Neustrashimiy-class frigate was to be blamed for the recent incident in the Mediterranean, but not the U.S. Arleigh Burke-class guided missile destroyer Gravely, the Defense News online weekly said on June 29, citing U.S. defense officials. On June 17, they say Yaroslav Mudry was intentionally trying to interfere with operations of the U.S. carrier Harry S. Truman which escorted Gravely in the Mediterranean, the online weekly says. In addition, the Russian patrol ship’s interaction "was assessed as unprofessional" when Gravely was requested "to maintain a safe distance" and the Russian frigate "raised day shapes ‘ball-diamond-ball,’ which is the international signal a ship displays when restricted in her ability to maneuver," the U.S. navy officers said, insisting that when Gravely changed course and speed, Yaroslav Mudry also changed course and speed. "The maneuvering demonstrates that 777 (Yaroslav Mudry’s side number) was not in fact restricted in her ability to maneuver, and was thus intentionally displaying a false international signal," they said. The Russian warship was trying to interfere with Harry S. Truman operations, the U.S. Navy said, approaching the U.S. destroyer at a distance of 300 meters and the carrier - at a distance of five nautical miles. "We have deep concerns about the unsafe and unprofessional Russian ship maneuvers," said the US defense official. "These actions have the potential to unnecessarily escalate tensions between countries…"
Meanwhile, Russia’s Defense Ministry had earlier expressed a contrary opinion about the incident in the eastern part of the Mediterranean Sea. The ministry’s press service said that Gravely came dangerously close to Yaroslav Mudry violating international rules and bilateral agreements. "On June 17, the U.S. guided missile destroyer Gravely approached the Russian warship at a dangerously close distance of 60-70 meters on the port side in the eastern part of the Mediterranean Sea and crossed the sailing route of the patrol ship Yaroslav Mudry at a dangerous distance of 180 meters from the ship’s bow," the press office said. 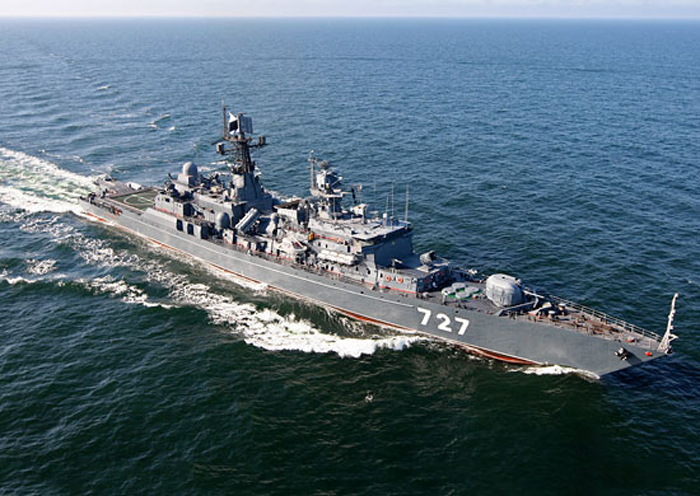 "The Russian warship was in international waters, cruising steadily and without making any dangerous maneuvers towards the US ship," the press office added. According to the Russian Defense Ministry, the US destroyer’s commander and crew violated the International Regulations for Preventing Collisions at Sea. "It should be noted that the US Department of Defense has been constantly accusing Russian pilots and sailors of the lack of professionalism. However, this incident concerning the dangerous maneuvering of the guided missile destroyer Gravely has shown that US Navy sailors allow themselves to forget about the fundamental principles of navigation security and ignore the consequences dangerous maneuvering can cause in heavy shipping areas," it said.